Hanaeleh was started after its founder rescued an untrained Arabian horse from a feedlot in Chino, CA. Many months of training later, Cleopatra competed in dressage and western shows as well as in endurance. She is the horse in our logo and our reminder that beautiful horses are being needlessly slaughtered everyday. NOTE: At Hanaeleh, our credo is to keep all equine abuse information palatable without whitewashing. We want you to have all the facts and the following descriptions may cause upset or uneasiness. While the slaughterhouses in the United States have recently been closed, horses are still being slaughtered– they are merely being shipped across the border to Canada and Mexico, where they meet horrific ends. In Mexico, for example, horses are repeatedly stabbed with “puntilla” knives until they bleed to death. In Canada, the horses are hit with “captive bolts” which are supposed to kill the horses immediately. Unfortunately, these bolts were designed to slaughter cows, not horses, and the horses often have to be hit repeatedly, causing them extreme pain and suffering. These are not horses who are bred for meat, but sport horses, race horses, foals, stolen horses and horses who could have been a little girl’s best friend until purchased by a killer buyer at an auction. Notwithstanding the enormous environmental, legal and other concerns that a slaughterhouse brings to a town, the suffering of the horses who are sent to these plants is astronomical. They are sometimes put into trailers and left for days without water, then half-crazed, they are violently prodded into the slaughterhouse, where they are supposed to be killed by a captive bolt. The horses are so scared that these bolts sometimes go into the horses’ eyes and the horse is struck again and again until stunned. It is very common for a horse to not be killed by the captive bolt, but only stunned, so that they are actually alive while being vivisected. Mares with foals are also slaughtered; the foals are cut out of their mothers and left to die on the slaughterhouse floor. Considering how horses are treated in the kill pens and how they are killed, there is no possible way that slaughter can ever be considered humane euthanasia. The SAFE Act would prohibit the purchase, sale or transportation of horses across US borders for the purpose of human consumption. Please join Hanaeleh, the Humane Society of the United States, Animal Welfare Institute, International Fund for Horses, Equine Welfare Alliance, Inc., Habitat for Horses and Veterinarians for Equine Welfare as well as the 80% of Americans who are against horse slaughter. Tell your representatives to pass the SAFE Act! Click–> HERE Enter your zip code + four. Write down your legislators’ email and phone number. Click–> HERE Type “HR961” into the search bar. Once you’re there, click the tab that says “Cosponsors” to see whether or not your representative supports H.R. 961. If they support the SAFE Act, call and thank them! If they don’t, call your representative every Wednesday and politely request that they cosponsor H.R. 961 – the SAFE Act. It takes less than 3 minutes and most of the time, you get voicemail. DONATE – please click the link below to help us save more horses! Even the fact that we are better able to care for our elderly horses with medical aides and joint supplements has led to the decreased demand for horses. One of the most unfortunate reasons that we have too many horses is that breeders continue to breed horses without regard for the quality or the need for their animals because they know that they can sell them at auction, even if it means the horses will go to slaughter. These breeders know that there is not a viable market for what they are breeding but they continue to do so, and will continue to do so unless the slaughter pipeline is closed. Just as the dog and cat population can only be solved by curbing overbreeding, so then is the solution to the issue of too many horses. One of the most unfortunate victims of over breeding is the Quarter Horse. While the AQHA continued to report decreased registrations, breeders continued to breed, and it is no surprise that the most popular horse that is slaughtered is the American Quarter Horse. Thoroughbreds are also popular victims of the slaughterhouse, both those horses who are not fast enough for the track and those who are physically broken down and lamed by corrupt or morally deficient trainers. In essence, slaughter created a false market in which breeders could unload horses that they could not sell otherwise, and therefore they continued to breed without regard to whether or not there were other buyers for their horses. Horse slaughter created the problem that its proponents state it will solve– it’s not possible to continue to create a market for horses will lead to the decreased population and stabilization of the horse market. The people who continue to breed the best quality horses will continue to have a market for their animals and those who breed for the purpose of having more stock will find themselves out of business. Think about it…how many Friesians do you think end up at the slaughterhouse? Hanaeleh does not see horses in the same classification as livestock for a number of reasons. First and foremost, horses are bred to be companions and we feel that they should be classified as a companion animal, not merely livestock. Horses are trained to be riding mounts, they are used for mental and physical therapy, and some miniature horses are even trained to help the blind! Horses have been domesticated for 5,000 years not as a meat animal but as a means of transportation, for war, and as companions. For this reason, people have a special bond with horses, very similar to the relationship that we have with dogs and cats, and should be treated as such. One of the most common questions we’re asked is why, if there are many horses, we do not feel that they should be slaughtered– our answer is for the same reason that cats and dogs are humanely euthanized: because they are our friends and companions and deserve a noble end. Horses are not bred for human consumption. Unlike other livestock, horses are wormed, given supplements and medicated without thought to the fact that these carcinogenic drugs will be toxic to humans. The guidelines are so lenient for horses as opposed to other livestock that a horse can literally be bought at an auction in the morning and that afternoon can be shipped to a slaughterhouse. No consideration is given to the quality of their meat or the physical condition of the horse. While strict regulations are set for other types of animals, sick, dying, lame or medicated horses can be slaughtered and their meat sent out to France, Belgium and Asia without any thought to the quality of the meat. The European Union has determined that horse meat is actually hazardous to human health and put restrictions on imports! Horses are NOT humanely euthanized when they are slaughtered. While health standards ignore the quality of the horse meat (ie: wormers or medications), there are strict guidelines as to how a horse should be slaughtered for human consumption. When veterinarians euthanize a horse, they give medications to calm the horse first, then they give a medication that stops his/her heart. A horse in a slaughterhouse, however, is often killed by having a bolt driven through the front of his/her head, just as a cow might. Horses are different than cows! The of the hardest parts of the horse’s head is that exact spot where the bolt would be, and sometimes multiple bolts must be used to finally end the horse’s life. In Mexico, as has been mentioned, horses are stabbed repeatedly in the neck until they bleed to death. This is inhumane and cruel, and our horses deserve better than a torturous end. Essentially, all types of horses can end up at the slaughterhouse, including horses such as the 112th Kentucky Derby winner, Ferdinand, who won over $600,000 but was slaughtered because he didn’t prove to be a worthy enough stud. Many ex-racehorses are shipped to slaughter instead of retrained for a future life off the track. (OTTB = Off Track ThoroughBreds). Quarter Horses, Arabians, Morgans, Tennessee Walkers, etc.– all are welcomed by the slaughterhouse. The most common horse slaughtered, however, is the American Quarter Horse. Many stolen horses end up at kill pens and slaughterhouses. Because no consideration is given to the horse’s past, many stolen horses end up at the slaughterhouse. In an effort to make a quick buck, people steal other people’s pets and sell them to the slaughterhouse; the slaughterhouse doesn’t even have to check for a microchip before they put an end to someone’s pet. Netposse.com was created to help reunite horses with their owners, and found a great deal of these stolen horses were stolen for the purpose of being sold to slaughter. It is a MYTH that slaughterhouses in the United States are more “regulated” and therefore “better” because the horses don’t come to as horrific of an end. The FACT is horse slaughter in the United States was just as horrific as horse slaughter in Canada. Horses were still alive while being vivisected. The slaughter plants in the United States were written up time and again for animal waste and runoff into the rivers and streams. Neighbors reported hearing screams of the horses at all times of the day and night. Things were so awful that the mayor of the town actually pleaded to have the slaughterhouse closed. The TRUTH is that slaughter is torture. Insinuating that one type of torture is better than another is misguided and it’s why Hanaeleh provides as much information as we can about the myths. Hanaeleh works to urge the public to work towards a future where our horses are not tortured in the U.S. or across the border; where they are not brutally killed anywhere. Another MYTH is that the lack of horse slaughter has led to the increased abandonment of horses. There are a number of reasons why people abandon their horses, just as there are reasons people abandon dogs, cats and even children. A troubling economy and financial struggles have caused a rise in dog and cat abandonment, but no one suggests slaughtering them to solve this problem, right? Horse slaughter was made illegal in California over ten years ago. Horses were being abandoned before this and they will continue to be abandoned in the future, no matter what the legislation is on horse slaughter. Many of the most drastic cases of horse abuse and neglect actually stem from hoarders, which is not directly related to slaughter at all, but is really a human mental health issue. 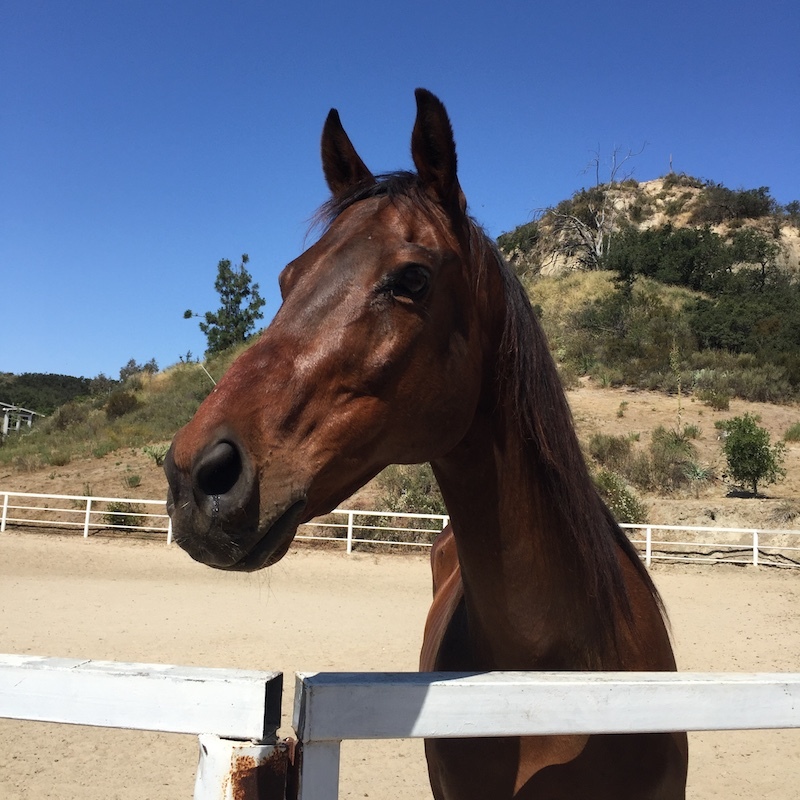 Hanaeleh’s purpose is to offer owners an alternative to abandonment or neglect by allowing them to donate their horses to us or another local rescue, or even to the local humane society instead. There are many alternatives to sending your horse to auction. If you or someone you know finds themselves in this situation, please reach out to us: Email Elizabeth or our –> Facebook page, Twitter, or Instagram. We believe that the sick, elderly or extremely dangerous horses deserve a noble end to their lives with human euthanasia – not scared to death by being forced into a chute, trampled on by other horses and then brutally, cruelly killed. Our horses are bred to be our friends and companions. The United States is not a society that needs or even desires horses to be used as a meat source. If a person has a horse that needs to be euthanized, but does not have the funds to pay a veterinarian, then that person can contact local rescues or humane societies for financial assistance. Please click the DONATE button below so we can spread this message further and save more horses! Please watch our :30 video on the Horse Slaughter Prevention Act, a precursor to the SAFE Act. Hanaeleh thanks Change for Balance for helping us produce this amazing video. Hanaeleh is a 501(c)(3) (Tax ID 20-3255341) Nonprofit horse rescue operating in Southern California since 2004 and every penny donated goes to the horses. Click the DONATE button below to help us save more horses!